This case is about an 8 year old female cat that was exhibiting weight loss, sneezing, congestion, lethargy and decreased desire to eat. 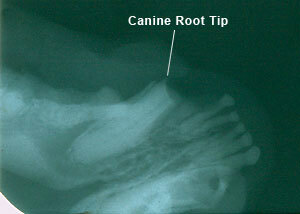 Our examination yielded a very reddened mouth and oral x-rays revealed 26 root tips that were still in the mouth. 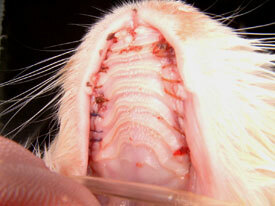 These exposed root tips had caused such severe abscessing that she also suffered from chronic sinus infections. Additional investigation revealed that she had undergone oral surgery at another practice, where only a portion of each tooth was removed, leaving behind the roots and exposed nerves. We performed surgery, which included the removal of numerous bone chips and root tips. We also performed a bone graft repair. After surgery, our patient was able to eat on her own that night! She was finally free of pain and infection. Her chronic sinus infection required multiple antibiotic treatments, but today she is bright and active, eating well and maintaining a healthy weight. Mouth is open to reveal upper (or maxillary) left and right quadrants of severe periodontitis (see extreme red gum areas). Note the upper left canine tooth root is visible and packed with debris. 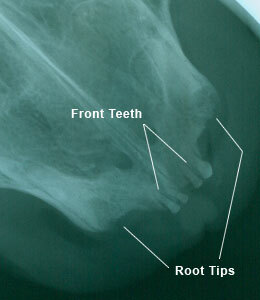 X-rays (shown below) revealed over 26 root tips, including canine tips that had been drilled off and left behind by another veterinary facility. Over 2 hours of work the upper oral quadrants are free of root tips, bone fragments and sharp jagged surfaces. Bony surfaces were drilled smooth, alveolar sockets filled with synthetic bone graft particulate (Consil) and Acell applied. Sites were closed with 4/0 gut. 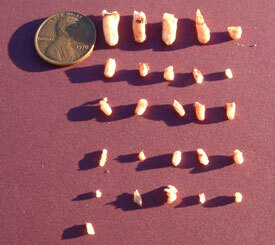 Here we have 26 recovered root tips including the 4 canine tips. Not pictured are the countless bone chips and fragments that were also recovered from this previously painful mouth.